A Web Form Autoresponder is an automatic way to send emails. Once a person submits your HTML Form, Autoresponder automatically sends your message to that person. Provide reassurance that the form submission has been received. Advise what to do next. Send a discount coupon code. Send promotional information about your products or services. Send instructions on how to access a special, restricted area of your web site. The implementation is very simple and takes only a few minutes. All you need to do is paste our code into your web page. The ProCaptcha Autoresponder can send both plain-text and HTML emails. The Autoresponder can use information from the submitted form; for example, if there is a field FirstName in the form, the Autoresponder can apply "Dear [FirstName],", which will take the submitted first name and insert it into the email. 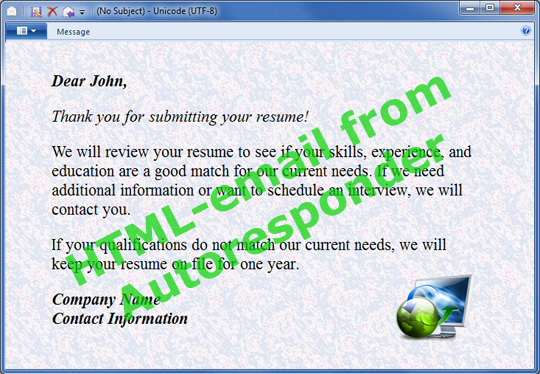 Below is an example of a Resume Upload Form and Autoresponder email. The form accepts visitor's file (resume) and sends a well-formatted email to the visitor. The Autoresponder email can contain images, links, background, different fonts, etc. - just as HTML page. ...or click here to read about all ProCaptcha features. Thank you so much for this excellent service. Quite often you get what you pay for, but in this case you get way more! Professional, friendly and prompt. In this day and age of internet rip-off it's refreshing to find a company with integrity.